Place: St. Agnes Branch Library, 444 Amsterdam Ave. (81st St.), 3rd Fl. 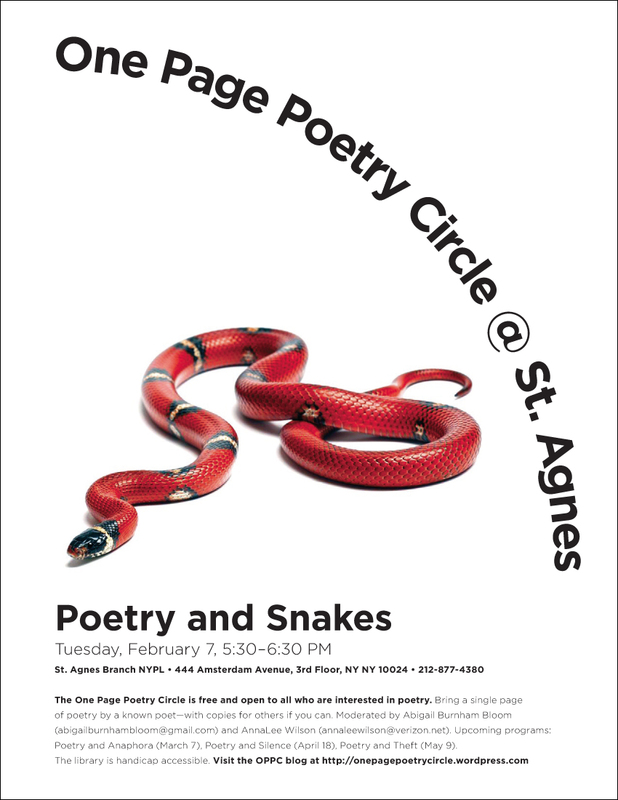 We’re back for the ninth season of the One Page Poetry Circle where people gather to examine the works of established poets. While there’s no instructor and this is not a workshop for personal writing, once a month OPPC gives everyone a place to become teachers and learners to explore the form, content, language and meaning of poetry. Since the circle started, participants have selected and discussed 955 poems and have read countless others in pursuit of poetry that speaks to them. Snakes! Yikes! It’s hard not to respond strongly to them and admire them for their mythic appearances in the Garden of Eden, the works of Dr. Freud, the flag of Mexico, the “don’t tread on me” sign, in the grass, and on the campaign trail of Donald Trump where he recited the lyrics of “The Snake,” an Al Wilson song written by Oscar Brown, suggesting the cold bloodedness of snakes and refugees. Because of their ability to shed their skin snakes are also a symbol of rebirth, transformation, and healing, fitting for the start of a new year. The man wrestles with the familiar lessons: that he should fear the evil snake, that to like the creepy guy is perverse, and that not to kill him would be cowardly. The voices within him prevail, and he strikes the creature when its back is turned. When the poem ends, the man recognizes he has made a mistake. He regrets his sin of narrow-mindedness and must atone. It’s upmmmmmmmmmmffffffffff . . .